If you require any of these services, or anything related to elder law or asset preservation, we can help. And the best part is, you will always know what to expect when working with our firm. 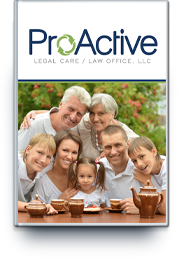 ProActive Legal Care uses fixed fee agreements with most of our clients. You will always know what our representation will cost you. We will provide you with a fixed fee agreement for the attorney’s time instead of getting billed by the hour. This means no extra charges to you for phone calls to your attorney when you have a question or concern. Additionally, we practice law from a Christian perspective. When you face end of life issues, it is critical that your counselors share the same values and worldview. We practice the Golden Rule every day so that you will know that your legal matters are handled ethically, competently, and confidentially. We pride ourselves on being an uncommon law practice that focuses on improving the overall quality of life, health, independence, and longevity of seniors—while at the same time helping to preserve their family’s resources. Please don’t hesitate to contact us to set up a consultation with a knowledgeable and experiences elder law attorney. We look forward to helping address all your concerns and finding the right solutions based on your specific goals.